Laura is a modern city hippie, with a big heart for people and sweets. The mother of four lives in the centre of Berlin with her family and created a peaceful oasis in this vibrant city. 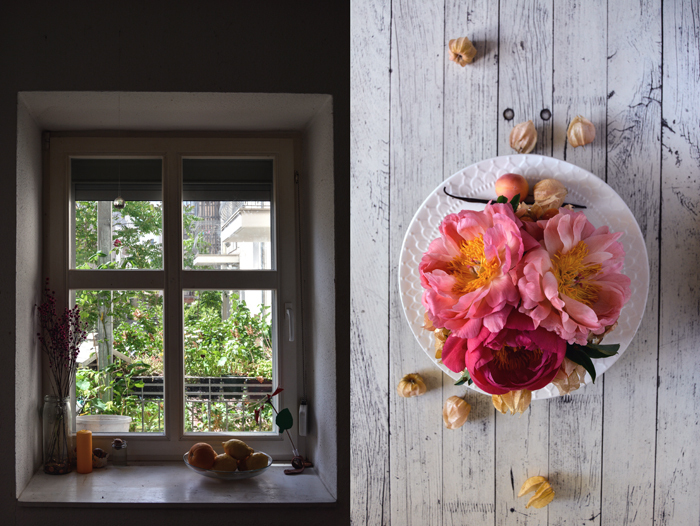 Her kitchen faces a little veranda and if you walk down a few steps you’re right in her fruitful garden. Pots are lined up densely, filled with the most beautiful flowers and vegetables, rucola, peas, herbs and potatoes – it’s a green paradise, as calming and gorgeous as the lady of the house. 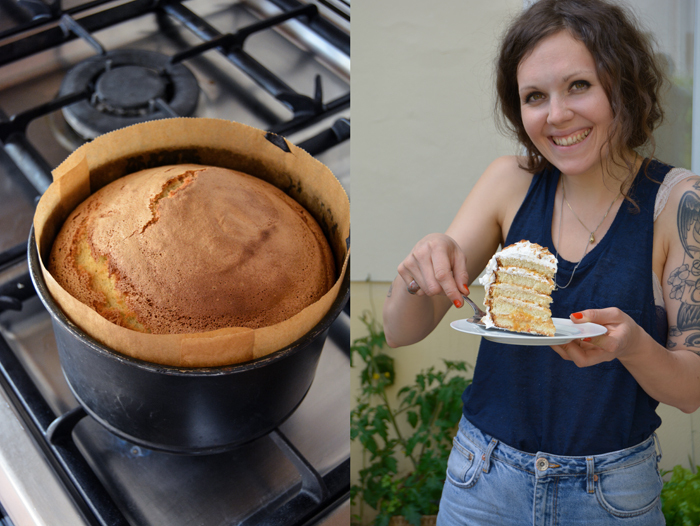 When I visited Laura’s kitchen to chat and bake together, it felt like a Bohemian farm house scene set in summery Provence. The light that falls through the small window in the thick wall is a bit dimmed and adds a Mediterranean flair to the family’s home-made kitchen. It’s a very personal room and you can feel that this is the creative space of a woman who completely falls for her passion to bake. Her oven and fridge impressed me with their huge dimensions, the walls and shelves are filled with baking tools, pans and ingredients. Laura doesn’t need to show off with overly designed furniture, its her personality, her honest kindness and charming smile that makes you want to sit at her kitchen table all day, to watch her work on her amazing cake creations and listen to her family stories. Growing up in Germany with her parents from Chile and Bolivia this woman is gifted with a rich multicultural background and a great sense for quality. Laura calls her mother and father two hippies, early pioneers of the organic, sustainable and self-sufficient food movement. They introduced her to this now rising trend. Growing your own vegetables in the middle of the city, using old pots, jars and bags to plant the seeds for your own produce became popular all over the world. In Laura’s yard, it’s a very unspectacular reality, if you want to know what you have on your plates it’s best to farm it in your own ground. This fascination for food in general, but for baking with the best ingredients in particular, led to a business which is one of Berlin’s best kept sweet secrets. Laura started Tausensuend a few years ago to offer her individual and luscious cake creations which are honestly out of this world. 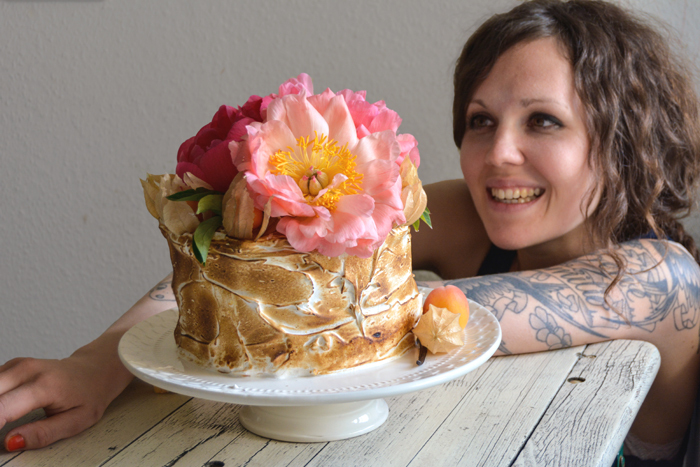 She follows her interest in raw vegan cakes (her ‘healthy cake line’) but she also makes the most decadent layered cakes with creams, meringues, fruits and caramel, spectacularly topped with huge flowers. This is eye candy in its literal sense. Set the oven to 190°C / 375°F (top / bottom heat). Grease an 18cm / 7″ cake pan (tall) and line it with baking paper. You will need a tall cake ring of the same size to assemble the cake and a candy thermometer and blowtorch for the flambéed meringue frosting. Beat the egg whites with a pinch of salt on high speed for about 5 minutes until very stiff. Add the sugar and continue mixing for 5 minutes until stiff and glossy. Quickly mix in the vanilla. Whisk the egg yolks with a fork and gently fold them into the stiff egg whites. Once it’s combined, gently fold in the sieved flour. Scrape the dough into the lined cake pan and bake for 45 minutes. Check after 35 minutes, if the top of the cake turns too dark, cover it with baking paper. When it’s done, take the cake out of the pan and let it cool completely. In a sauce pan, warm the cream on low heat (don’t bring it to the boil), set the pan aside. In a large pan, melt the sugar on high heat, watch the pan as the sugar burns quickly. Whisk once in a while and try not to let the sugar forms large lumps. As soon as the colour changes to a light amber, reduce the heat, keep stirring until all the sugar has melted. Add the butter in batches and keep stirring. Carefully pour in the warm cream at the end, mind that it bubbles up and creates steam. Stir in the salt once the caramel is well combined, pour into a jar and set aside. Purée the fruits, lemon juice and zest in a blender until smooth and set aside. Whisk the ingredients until creamy and set aside. Cut the cake into 5 layers and lay 1 slice into the cake ring. Spread thinly with the apricot purée and sprinkle generously with salted caramel. Spread the bottom side of a new cake layer with the ricotta cream and lay on top of the cake in the ring. Continue layering the cake in the same order (cake-apricot-ricotta) until all the layers are used up, finish it off with a cake layer. Put the assembled cake in the fridge and let it cool for at least 2 hours (overnight would be even better), the cake should soak up all the liquid of the filling. Place a large metal bowl in a large pot with boiling water. Add the egg whites and sugar to the bowl and whisk lightly. Leave the egg whites on the heat until the mixture reaches 60°C / 140°F, check with a candy thermometer. There’s no need to whisk while heating the eggs. Take the bowl off the heat once the right temperature is reached, add a generous pinch of salt and beat with an electric mixer until thick and glossy. When it forms stiff peaks, stir in the vanilla. Carefully take the cake out of the ring and cover it generously with the stiff egg whites. Flambé with a blowtorch until golden and decorate with fresh winter cherries and flowers. 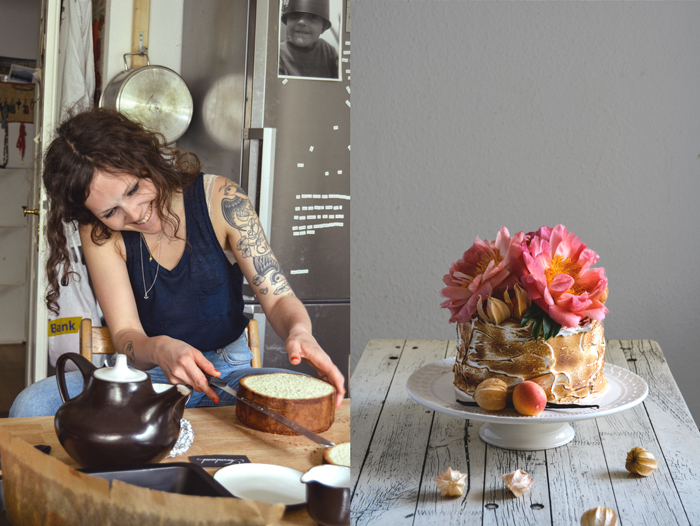 Tausendsuend is one of Berlin’s best kept secrets for the most luscious cake creations, when did you start using your fantastic baking skills professionally? What was the impulse that got your business started? Oh thanks a lot, Meike! Working and playing around and experimenting with food, textures, colours and flavours has always been one of my greatest passions, even when I was a child. But baking, I would say, is my greatest love, and also the thing I always had the strongest connection to, due to the baking skills of my fantastic grandmother. It’s probably the mix of the smelling and tasting of the fresh ingredients and this sculptural way of putting a cake together, making the colours match, arranging the flowers, all the decorating, that interests me. A friend of mine, an artist from Los Angeles, once said, she has a strong feeling that we have the same approach to our work, and that is probably true! I worked as a cook for a couple of years, and then got asked if I wanted to take care of the sweets department in that place because I was somehow famous for my cheesecakes at that time. So I did that and it was a crazy success! Really cool! That was the point, when I started to focus on baking. I started Tausendsuend when I moved to Berlin in 2008, but it was really a long process of defining my own style and making the right connections. Also, I gave birth to 2 children within that time I must admit. You pay a lot of attention to the quality and origin of each ingredient you use, for your healthy raw cakes as much as for your more traditional layered cream and meringue cakes. 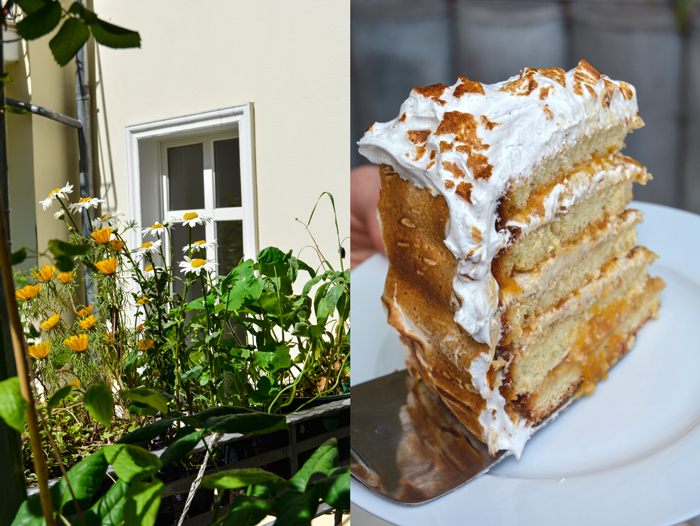 Is there a different approach in the creative process for these two kinds of cakes, how do you develop the recipes – healthy and conventional? I personally love the raw cakes. It’s just great to develop something that satisfies this craving for sweetness and is so good and healthy and nourishing for your body and soul at the same time. I have 4 children and it is the greatest bliss to feed them a raw avocado and lime cake in the morning and make them really happy with it! This is also something that I suggest to parents of children who don’t eat any fruits or vegetables. I’m really lucky not to be one of them, I’m blessed with children who eat almost everything, from seaweed to artichokes to raw avocado lime cake. You were born in Hamburg and grew up in Germany but your father is originally from Chile and your mother from Bolivia. How do your South American and German roots influence your cooking and baking? What did you learn from these different cultures? My grandmother, originally from Hamburg, lived in Bolivia for over 30 years. I loved her stories about shopping at the farmers markets in La Paz, the enthusiasm you could hear in the way she described the Indian women in their traditional garb. She told me a lot about the Bolivian habits, how the Indians made the Chicha, a traditional schnaps (spirit) that is made by chewing white sweetcorn and spitting it into a bucket to let it ferment. Or the kilo bags of dried Bolivian chili peppers of which she used to make the extremely spicy traditional Aji Sauce. And the Yerba mate of course, a herbal tea that you drink out of hollowed dried pumpkins with a pewter straw. This you do in Chile as well. My father has always been the one who cooked most of the time for us as a family. He made a million empanadas for every occasion, school treats, dinners with friends and so on, one of the national dishes in Chile and Argentina, traditionally filled with beef, onions, raisins, black olives and boiled eggs, that everybody loved, and still does. My children go crazy about them. I think my favourite dish as a child was Pastel de Choclo, a casserole dish made of minced beef and mashed sweetcorn with a sugar crust, so good!! My father is an incredible cook, definitely the person I feel the strongest similarities with in the way I create food. A freestyler and always super curious about discovering new flavours and combinations. I’m very lucky that I have always been surrounded by people who had a very strong interest in food. Your parents were early pioneers in the organic, sustainable and self-sufficient food movement that is so popular today. How did this affect your relationship with food and your definition of quality of life in general? My mother was always the one who had the more ecological, political attitude towards how to consume and produce food. She went to shop in small organic grocery shops that were really rare at that time and she had a strong focus on whole foods. She used a lot of millet, quinoa and amaranth in her cooking, things that, at that time, were totally unknown to most people. This curiosity and trying out new and unknown things is something that influenced me extremely. In general my parents were very political and taught us to call things into question. That had a strong influence on all fields of activity in my living and working. I find a lot of people inspiring, for very different things. My father is still one of my biggest inspirations, because he is such an artist in juggling with flavours, but there are also a couple of books that I bought in the last years that I find very inspiring, Tartine Bakery for example makes great classic stuff! And the Canadian raw food cookbook author Emily von Euw is so great as well, what an artist! Which are your favourite Chilean, Peruvian and German dishes? Oh, that is so difficult to say as I love eating so much and it’s really hard for me to say what dish I like more than the other. As I’m from Hamburg, I have a strong connection to seafood and I still enjoy to go to the Fischmarkt (fish market in Hamburg) on a Sunday morning so much, to grab a sandwich overloaded with the freshest shrimps and rémoulade or some matjes (herring) with tons of fresh onion! I would say I prefer the simple, yet flavourful over the super sophisticated kitchen. My sister, who moved back to Chile after finishing school which is now almost 20 years ago, makes the most incredible ceviche which totally became my favourite Chilean dish. The Bolivians make small super spicy pasties filled with chicken called salteñas that are pretty amazing! But to be honest, there are really only very, very few things that I do not eat. Where do you find inspiration for new creations? Absolutely in nature. Strolling through organic farmers markets, smelling fresh fruits. I just visited a friend who moved from Berlin to the Uckermark (an area in the countryside), being in nature, in the countryside fills me with energy and inspires me a lot. 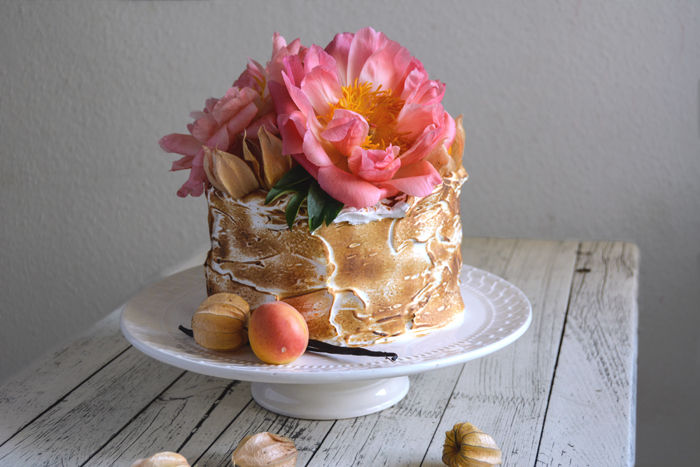 Why do you like to decorate your cakes with giant flowers which became your signature style? I have a strong love for flowers which I most probably got from my grandmother. 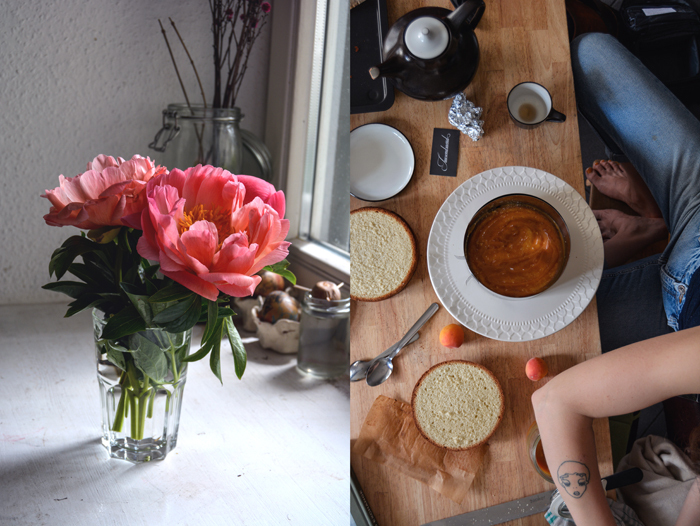 She used to live in the suburbs of Hamburg which almost felt like being in the countryside. There was a small farm within walking distance from where she lived and she taught me all the names of the flowers, wild berries and herbs, of all the small insects and butterflies. She also had edible flowers on her terrace and told me how to use them. My first job as a teenager was at a flower shop. If I had not focused on working with food I’d most probably be a florist today. Do your kids join you in the kitchen? How do you introduce the younger ones to the world of food, how do you spark their interest? Absolutely. I let my kids join me in the kitchen whenever they want. We do the shopping together, I let them select the vegetables, I let them help me with the cleaning and cutting and they always get a bit of dough when I bake. The older ones (my kids are 4, 6, 10 and 11) even start to cook on their own now with our help. To let the kids take part in the process of buying and creating food and to let them develop their own likes and dislikes and their own taste is the greatest and most successful way to raise their interest in food and eating. My very first steps in cooking were with my grandmother. She always took me to the farm, which was close to where she lived. The old farmers couple loved me and let me slip into every little corner. I was allowed to pick berries, to take the eggs out of the henhouse, they even allowed me to be present when the little yeanlings were born. My grandmother made little crocheted shopping bags for my sister and me where we put in all the treasures that we got at the farm. I must have been around 3 when my grandmother first suggested to make scrambled eggs out of my freshly collected eggs. I remember it being a mix of heartache and excitement to break the little eggs into this cute little pan that my grandmother bought for us. I still have that pan. I still like the small organic farmers market at Kollwitzplatz on Thursdays right around the corner from where I live. Some say, this market became too touristy within the last years, but still, it provides a great variety of organic locally produced goods. There, I also buy the edible flowers for my cakes from two lovely old ladies who have their own flower garden in Marzahn. Only a few hundred steps from my house I have a fantastic small delicacy store (Le Flâneur) that sells the best cheese I’ve ever tried and a small assortment of really good Champagne (yes, I love Champagne!). Every couple months I ride my bike to the Dong Xuan Center in Lichtenberg, an Asian food market, where you can buy every single Asian ingredient you could ever dream of. I travelled through Asia for a while and this place really reminds me so much of it. It’s a bit like plunging into another small world. You also get an incredibly good pho (Vietnamese noodle soup) there. Frischeparadies Lindenberg is a safe address for fresh, high quality and rather rare products. Even if they don’t have an ingredient in stock, you can always ask, their staff is very helpful and friendly, and they will do their best to try and get what you’ve been searching for. I recently searched for the very rare and hard to get fresh Scandinavian cloudberry, Lindenberg was the only place that could help me to get the fresh berries. And then there is this fantastic organic butcher in Berlin Wilmersdorf (Bachhuber). That place…wow! 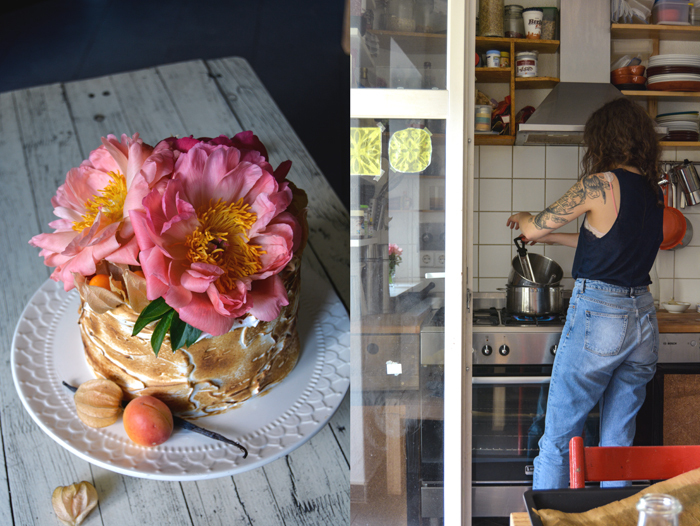 You shared your Apricot Salted Butter Caramel Meringue Cake on eat in my kitchen, what do you like about this combination? Well, it was freestyle mostly. 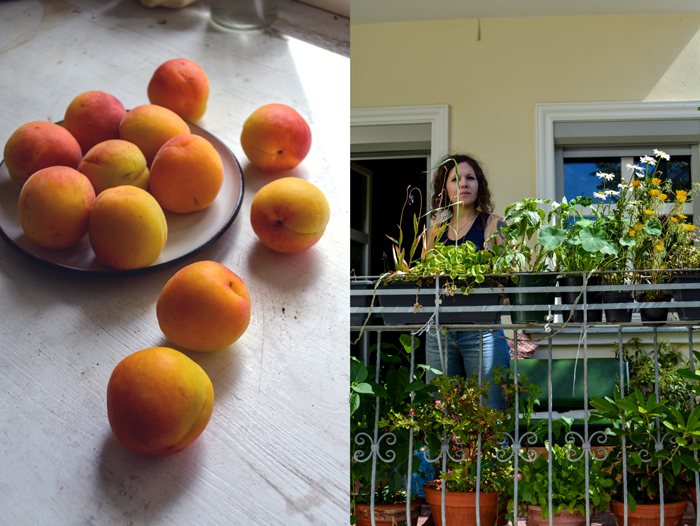 When I did the shopping the day before we met I just could not resist the floral smell of the fresh apricots. Apricots are also just such a winner with salted caramel, don’t you think? And the flambéed meringue is always my ace in the hole, when I really want to impress somebody! I would love to meet the biodynamic Champagne producer David Léclapart and his daughter Sylvie Gerard Maizieres. She runs a small boutique museum dedicated to Champagne where she organizes Jazz concerts and cooking courses as well, called Pré-en-bulles. I would definitely ask my dear friend Malin from The Bread Exchange for bread. Since we know each other, I bake her cakes for special occasions and she bakes her outstanding sourdough bread for my dinners in return. I would get a variety of good cheeses and butter, fresh artichokes with a light vinaigrette, make a cold or hot soup (I love soup) and a big bowl of fresh salad. And yes, of course, there would be a cake. That’s what everybody expects when being invited to my house. My grandmother’s caramelized apple pancakes were a total hit, unbeatable! Right now I would say everything that is produced freshly and with a whole lotta love. At the Bite Club (Berlin street food event) I recently had a pancake made of cabbage, okonomiyaki, wow! That was so good! I love spicy food, I love Asian food, I love fresh veggies, I love a good organic sausage, I love seafood … the list goes on and on! Oh and I could live off ice-cream for a very long time, my favourite parlour is Rosa Canina. I love to have people around me, but to be honest, I tend to be a bit bossy in the kitchen, so it’s more the question if others want to cook together with me. Gorgeous! So happy I fell upon your site!